I was in the doghouse for not baking my wife a cake for her birthday. She told me she didn’t really want one with all the Christmas cookies and the red velvet cheesecake cake that I made. But I could tell she was upset when we returned home from Vermont after the holiday. So, I asked her what kind of cake she wanted, and she said something like, “chocolate. chocolate. fudge. chocolate.” I found this recipe and thought that the story was interesting. I wasn’t super-impressed by the cake. I didn’t really find it that fudgy. 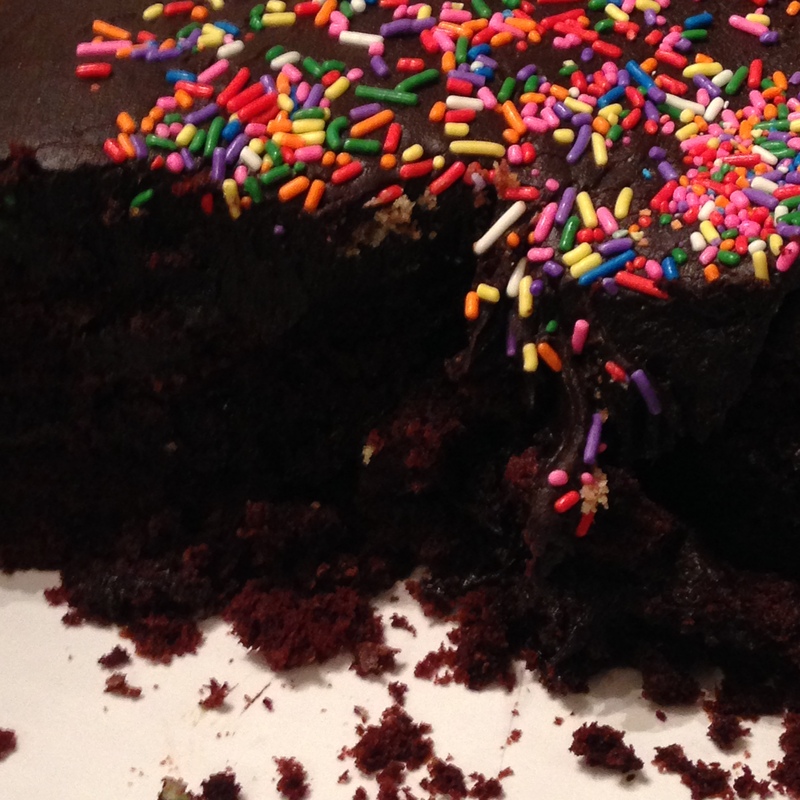 The frosting kind of made the cake fudgy, though. The best part about the cake was the area in the middle of the two layers that was absorbing the chocolate moisture from the frosting with each day that passed. I was more impressed with the cake on the second and third day of eating it than I was on the first day. The recipe for the frosting contains some ingredients not typically found in frosting recipes, notably brown sugar and half & half. I think I’ll use it in the future as a ganache substitute in between cake layers since I still haven’t found a ganache recipe that I like. Whisk flour, , baking powder, baking soda, and salt in a large bowl. Set aside. In a small bowl, whisk together hot water and cocoa powder until smooth. With an electric mixer on medium speed, beat butter and sugar until light and fluffy (about three minutes). Add eggs, one at a time, and mix until incorporated. Add flour mixture in thirds, alternating with the half of the buttermilk until combined. Reduce speed to low. Slowly add the cocoa powder and vanilla extract until incorporated. Divide the batter between the two cake pans. Bake for 25-30 minutes or until cake tester comes out clean. Let cakes cool in pans until cool to the touch, then carefully invert onto a wire rack lined with parchment/wax paper. Carefully remove parchment/wax paper from bottoms of cakes. For the frosting: Sift powdered sugar and cocoa powder together. Heat 4 tbsp. butter, brown sugar, salt, and 1/2 cup of half & half in a large saucepan over medium-low heat, stirring occasionally, until small bubbles appear around the perimeter (about 4-8 minutes). Reduce heat to low and simmer, stirring frequently until mixture thickens and turns a deep, golden brown (about 8-10 minutes). Transfer to a large bowl. Slice remaining butter into four tablespoon pieces. Stir butter and remaining half & half into the other mixture. Add the chopped chocolate and vanilla extract until combined. Cool to room temperature, stirring occasionally. Refrigerate for 30-40 minutes, or until the desired spreading consistency is achieved.